Poker Odds Calculator Pro Free for May 27! 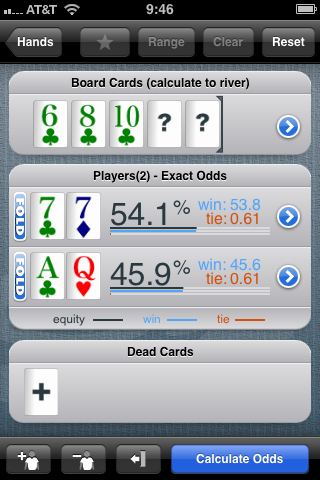 I bought Poker Odds Calculator Pro for my iPhone for $2.99 a little while back and really liked it. It’s not a simple odds calculator, it’s like PokerStove, with the ability to calculate odds against a custom range of hands, random hands, and a set of pre-defined ranges. It was just updated; the new version speeds up card entry and lets you drill down into all the various permutations of winning hands. I can’t recommend it enough, because for May 27, to celebrate the opening of the WSOP, developer Richard Mullinix is giving it away for free. I got to the club a little late, but still in the first round of the button at position 5. Didn’t play a hand until the button passed again and then boy, did I play a hand. 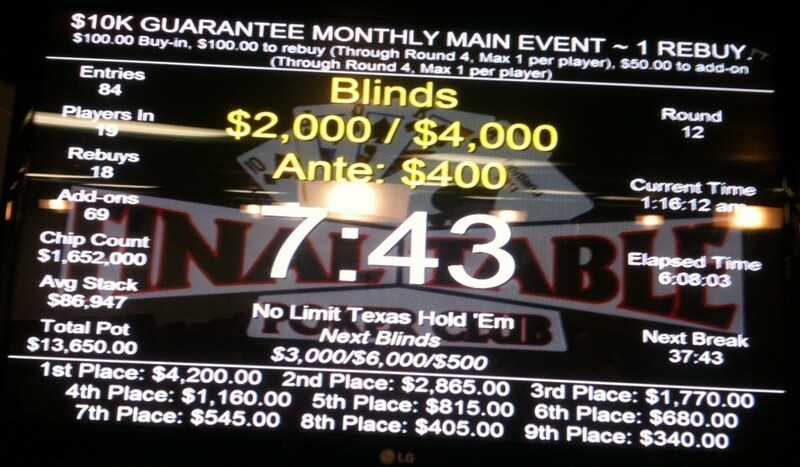 From CO, I called a raise to 200 from UTG with J♦T♥ that only two players didn’t call. The flop came out A♦K♦Q♥. Action checked to UTG and he bet 1,000. The players between us folded and I announced I was moving my entire stack in. Without too much hesitation, BTN called, and everyone, including UTG folded. BTN turned over Q♦9♦ and we were off to a very short race, as another diamond hit the turn and I was drawing dead. A black king came on the river and UTG was lamenting laying down his KxQx. I wasn’t completely out, I still had T200. The blinds were up to 50/100 by now, and I waited around for either a good hand or the right moment. No hand came, and figuring that at the very least, if I shoved UTG and got lucky, I’d maximize the gain from all the potential callers. I had 6♣7♠, so it wasn’t the worst hand to try something with. I got a couple calls, then the player who’d folded KxQx (who’d jst had to re-buy) raised to 800, squelching potential further action. We were heads-up to the flop, he had KxAx. The flop stayed low, pairing me on the flop and giving me a straight by the river. 5xQx on my BB, there are several callers, including SB, but I’m more than prepared to give my blind up and keep looking for spots to build. The flop, however, changes my plans: QxJx6x. SB opens with a bet of 250 and I push my remaining 575 into the pot and turn my cards. He says “You’ve got me out-kicked” and flips 2xQx. A 9x on the turn makes it look like we’re going to chop things, then the river coughs up a deuce and the game comes to a quick, dirty end. Had a very nice time talking poker with reader BP on Thursday, then he headed over to the Encore $1,800 game that night. I’m bearing down on the big games with 50+ players in preparation for the WSOP starting up this weekend, so I waited to head over until Friday’s $5,000 guarantee. I was seated in seat 7 at the first red table, with JL—one of the recognizably better regulars at Encore—two seats to my right. I came in fresh off reading Gus Hansen’s Every Hand Revealed and most of Arnold Snyder’s The Poker Tournament Formula 2, so I was ready to work hard. UTG2 with K♠2♠, I raised over a UTG call to 125. UTG called and we saw a flop of AxJx9x. I continued with a bet of 200, which UTG called. After that, we both checked through a 7x on the turn and 8x on the river. He must have been worried about a ten, because his 7♣8♣ was good and he didn’t bet it. I called with Q♥8♣ as CO to see a flop of Qx6x4x. UTG2 bet 200 and I raised to 500, getting a call. We both checked to the river and my pair held up against his missed straight draw. UTG3 holding 6♣9♣. The flop was AxTx8x and it was checked around with four players still in. With a 9x on the turn, I bet 275, which was called around. I folded to a 550 bet on the river 8x. Half an hour in, down to T8,875 and I’d already missed two opportunities to make two pair on the flop, with Q♥6♦ and 4♠8♠. Called a 300 raise with Q♦8♦ from BB to see a flop of A♥7♦T♣ but folded to a 550 bet from BTN. Down to T8,325. The first hand that turned things around at the table for me was 4♦6♦ as CO. I limped to see the flop with several others and saw 2x5xTx, calling a 250 bet with one other to get to the 3x on the turn. HJ bet 500 and I reraised to 1,500, then UTG2 shipped it and I called with the nuts. HJ bailed and UTG2 turned over 2 pair. Ax on the river didn’t help him, and I doubled up to T17,800. Just a few minutes after that, disaster struck with A♦7♦. I open-raised to 275, getting three calls to the Ax7x8x flop. With a little over 1,000 in the pot, I bet 1,000, hoping to shake off some people but only one dropped out. Qx on the turn and I bet 2,500, getting a call from the first player and an all-in from the other end of the table for 2,900 more. I called that, then the player who’d called me first shoved over the top for almost 8,000. By this time, there’s nearly 25,000 in the pot, and I call the extra 5,000. The original all-in has AxKx, the second all-in has beaten my two pair with AxQx, and a useless card on the river drops me down to somewhere over 6,000 chips. I look down at K♣Q♠ on my next hand and try something, by open-shoving from early position while the blinds are still just 50/100. It seems like a steam bet, what with only 150 in the pot, and amazingly enough, two players call, including one who’s just sat down into the BTN and the short-stacked BB. Two of us are all-in and the flop has a king on it, along with a ten. Tens on the turn and river give me the full house and before I have a chance to count up after my loss, I’m dragging in a big pile of chips. A couple minutes later on BB and I three-bet an UTG 800 raise to 2,200. He lays down AxJx and I show him my AxAx. Another KxQx on the BTN and I drag another pot with a raise. In the same round with 8x8x in HJ, I raise to 800 over three limpets, when the guy in CO who just folded AxJx to me shoves for 5,275. I call and he has 7x7x, which don’t get any better. He has to re-buy. Seventy minutes into the game, the chip average is 11,739 and I’m sitting on T29,775. UTG1 with KT I raise to 750. UTG2 calls and BTN shoves. I fold, but UTG2 (who was just busted with sevens ten minutes earlier) calls with AxKx and gets two pair on the turn. In CO with [an][enticing][K♦Q♦, I raise to 1,100 and get a caller, but fold to an all-in bet on the J♠7♠8♠ flop. I’ve lost some ground halfway through the second hour, but with T27,325 I’m still more than twice the average stack when we get to the first break. I get the T6,000 add-on. By the time break ends, there are 110 entries, 38 re-buys, and 96 add-ons, for a pot of $9,800 and a first prize of $2,820, with fourteen places paying. UTG1 with 5♠6♠, I raise to 800 and get one call. The flop is 6x4x3x and UTG3 bets 1,600, but I raise to 3,200 and he folds. T25,725. On BB with 3x5x I check through with several others to see the flop roll out Kx3x4x. I bet 1,000 and get raised to 2,500, which I call. Another Kx on the turn makes things look very unpromising and after I check my opponent bets and I fold. Cautiously called a 1,025 raise from JL holding A♥9♦. The flop was Tx5x5x and U folded to the first bet. In CO with KxJx I raised to 1,100 over a single limp. HJ called and we saw a flop of QxJx6x. I bet 2,000 for the win. At the two-hour mark, I was still down from my peak, but had T33,550. Average was still at T19,670 with 97 players left. 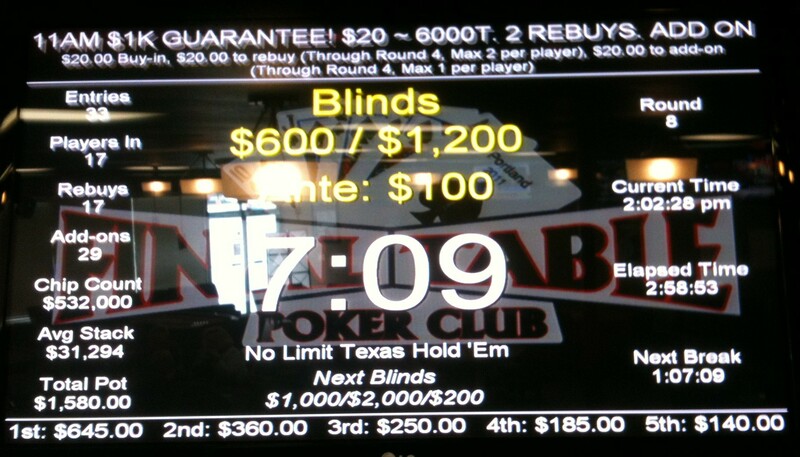 Ten minutes into the hour, I picked up 7♣7♦ UTG1. 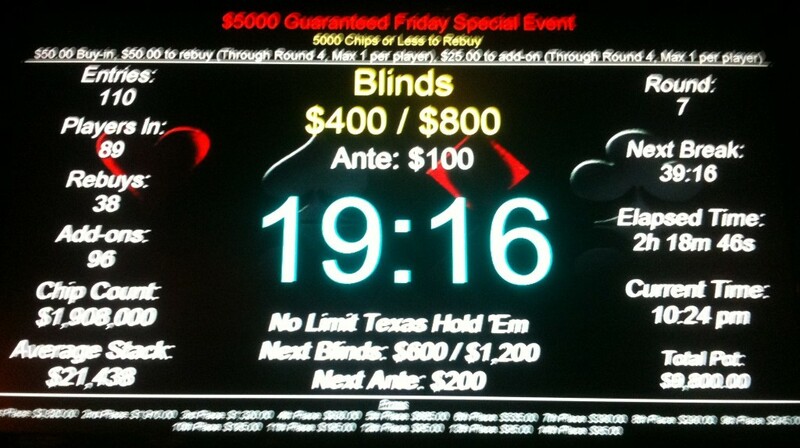 UTG called the 400 blind and I raised to 1,800. SB, who was the second-largest stack at the table next to me, three-bet to 3,800 and BB and UTG got out of the way. I called, and the flop was 6♣8♣T♣. SB checked to me. There was a better than 50% chance he didn’t have a club in his hand; I knew where at least four of them were already. Four of the remaining clubs were smaller than mine. So there were only five cards I was concerned about: 9♣, J♣, Q♣, K♣, and A♣. Even if he had one of those cards in his hand, unless he was paired, he was still behind me. He was behind me even if he had a pair of aces and one of them wasn’t a club. So I shoved with my made pair, my straight, flush, and straight flush draws. He showed A♣Q♥. I was a 54%/46% favorite. With J♣ on the turn, though, I was down to needing the 9♣ to keep from losing, but the river was K♣. The hit was for nearly 30,000 chips. Down at T3,400 with blinds at 300/600/75. Ten minutes after my big loss, I went all-in from BB with J♦T♦, getting a call from the short-stacked BB who just had me covered. He turned over AxAx. I paired my ten on the flop and had two diamonds on the board by the turn, but the river was no help and I was out. Two hours and fifteen minutes. 90th of 110 players. Best wishes to my home league host DV, who’s playing in Monday’s World Series of Poker Event #2, a $1,500 No Limit Hold’em tournament, for his second shot at WSOP glory. According to a Tweet from poker stats nut Kevin Mathers, there’s going to be a system in place at this year’s WSOP that lets people track chip counts at the breaks from home, so you can follow your friends. Got a copy of Gus Hansen’s Every Hand Revealed, his (almost) hand-by-hand account of winning an Aussie Millions tournament. Whatever you might think about Hansen’s style of play (and despite the fact that things may have changed a lot since he wrote the book) it’s a very interesting read and incredibly thoughtful and I don’t think I could possibly recreate hands as well even if I was using his tape recorder transcription method. Sorry. Also picked up Arnold Snyder’s The Poker Tournament Formula (volumes 1 and 2) and I’m hoping to pick out nuggets of useful info from there. Met up at the Eastside Ringside before the 10K with BP, a Mutant Poker reader (I guess there are a couple) who recognized me at a Friday Encore game a couple weeks back. Had a great time talking poker, had a drink or two (which I almost never do before a game), and then headed down the street. I started off in BB and folded a couple hands, then raised to 125 on BTN with Ax8x, calling a re-raise to 325. The turn was Q-high and I bet out for 700 but folded to a re-raise. UTG with 2x2x and I was drawing the low end of a straight on the flop, but BB flopped the nuts. and half an hour in I was down to T8,200. Called 350 with Qx9x but folded to an all-in war that ended up with KxKx drawing a set against AxAx. T7,500 now. UTG again with 8♦T♦ and I check-called a 300 raise. Flop of Ax4x5x and I was out of there. Forty-five minutes in: T7,050. QxTx as CO and I called a big pre-flop raise but folded to an all-in after a flop of JxTx8x and a bet on the Ax turn. Fifty minutes in and I’d lost more than half my starting chips: T5,250. In BB with A♥K♥, I raised to 2,000 and was re-raised all-in. I called against A♠T♠ and doubled up to almost where I’d begun: T10,650. Back on BTN, I raised to 400 and got one call. The flop was Qx7x2x and I bet 1,000 to take the pot. Back over starting: T11,275. Raised UTG with JxTx to 500 getting two calls half-an-hour later. The flop was a beautiful KxQx9x and it was checked around. The turn was a non-threatening Ax, it was checked to me and there was a bet of 3,000. I shoved over the top and was called by AxKx. My straight held. Tx4x in BB ten minutes later and I see the flop of QxTx4x. A guy who’s been going all-in throughout the game bets into it and I re-raise. As I expect, he shoves and I call because I’m pretty sure he’s not holding The Butcher, and my two pair knocks him out. He doesn’t show. Next hand in SB with 8x2x I call to see 4x2x2x on the flop and check. BB bets out 600, UTG calls, and I raise to 2,000 getting both of them to fold. I show the hand. A couple minutes later it’s my turn to fold 9x8x after calling 800 pre-flop. The board is QxJx8x but my bottom pair and low-end gut-shot isn’t good enough to call the 2,000 bet. One hour and forty-five minute into the game and I’m up to a healthy T30,575, more than 40% above the chip average. Five minutes later, I’m buying the add-on of T8,000 chips. There are 84 entries, with 18 re-buys. The break sees 69 add-ons and the pot’s $13,650, with 13 places paying. 77 players left at the break. After the break, I get to work, raising and taking the blinds and antes with Ax8x, then taking a pot atay from several callers with a post-flop raise with QxJx on a jack-high flop that put me up to T41,625. In SB with 3♠4♠ I called a raise to 1,700 from BB. The Qx2x5x gave me an open-ended straight draw and I bet 2,000 into it. BB tossed his cards and said he had AxJx. According to the odds calculators, if that was the case, we were almost exactly 50%-50%. I re-raised to 7,000 over a 2,400 raise with 8x8x and a small stack shoved for 6,950 more. Was my pair good? Was it a desperate move to steal 10,000 chips? It was going to cost me about 3.5:1 to find out. I called, was up against queens and lost. Pretty quickly I was back on track with TxTx. I raised over two calls to 4,000 and took the pot. One of the guys muttered he’d folded jacks. I was down to T32,000 but near chip average. Then in my BB I picked up 6x6♣ and laid in wait to see a flop of 6x4x2x. I’ve learned my lesson about being shy with flopped sets. I pulled the trigger and didn’t worry about the possibility that someone might have come along with 3x5x, I bet 2,000 and got a call, then bet 7,000 after the Tx turn card and cracked some aces. I was back up to T43,400 at the end of three hours. UTG fifteen minutes later with KxKx. I keep losing with kings, often by simply walking away from the board after a horrible flop. I raised to 2,700, getting three calls and a rather ominous QxJxTx flop. What premium hand isn’t beating me here? AxKx has the straight and my only hope against it is some sort of backdoor full house (or another ace to chop). QxQx JxJx, or TxTx has a set already and I need that ace or backdoor full house again. Any multitude of two pair hands in there that are playable by someone in a $10K tournament. Even 8x9x has me beat. So naturally when the player on my right goes all-in for more than 30,000 chips, I call. He has The Butcher, for two pair, but a miraculous 9x shows on the turn and I knock him out with the straight. Two hundred minutes into the game I’m up to T71,875. The chip average is T27,081. Twenty minutes later, there are 55 players left and the chip average is just over T30,000. I raise with Q♠T♣ over two calls, the flop is K♠T♠8♠. I try to get another spade but I’m lucky and don’t, losing to A♠Tx. Coming up on the end of the fourth hour of play as SB with 2x2x and I call an all-in of 4,700. He has QxTx and hits two pair on the flop. I start the next hour down to T50,600 with the chip average at T33,000. With AxAx in CO I raise to 8,000 and get a call. The flop is 9x6x4x and I’m all-in over a raise, getting a call from JxJx for a win. In UTG1, I call 4,600 with 9♣T♣. The flop is 7x9xJx and UTG bets 10,000 (a pattern his big stack will repeat throughout the rest of the night) and I have to fold my middle pair and gunshot. Still, I’m back up to T72800. I open from the CO with 2♥3♥ and take the blinds and antes. UTG1 again. I call 3,600 with Q♠9♠ and fold to UTG’s 10,000 bet after the Kx8x5x bet. In my SB, I raise to 11,000 with J♣Q♠. BB calls and the flop is KxJx9x This time it’s me who throws the 10,000 continuation and the guy to my left folds. Raised 7,000 with QxJx and called an all-in who showed AxKx. I stayed behind as my chips raced to the other end of the table. Hitting midnight after five hours of play, I was a little over the chip average, with T54,500. The Butcher came through, with QxTx beating a nominally better hand on a 8xTx8x flop and bringing in 20,000. Raised 10,000 a couple minutes later with 6x6x and lost to an all-in. Back down to T54000 by five hours and thirty minutes, with 28 players left. I shoved with KxKx from BTN sort of hoping to double up if someone thought it was a position play but just won the blinds and antes. Even so, by the time the I’d made it through the blinds, I was down to T50,300, more than 10,000 below average. Just twenty minutes later, that had dwindled to half the average, at T34,700, with only 22 players left. Just nine before the money bubble. As we approached the end of the sixth hour, I shoved with Ax9x over two calls and managed to win a pot that put me up to T40,600. Then, on my BB with TxTx I shoved over three calls and took another one down. Right after that I raised UTG with JxTx and won again. In twenty minutes I doubled my stack to T71,000 without a showdown. I was still below the T76,666 average. As quick as it came, though, it went away. I picked up KxQx mid-position and raised to 10,000 from the 4,000 big blind. I got two callers, including the big stack on my immediate right. The flop was Kx9x2x and I bet into it, hoping that nobody had AxKx. Both of them came along. The Qx on the turn put me all-in, the first call was from the a smaller stack, the second was from the mega-stack, who’d snuck in there with JxTx to make the straight. The small stack had QxTx. No king or queen for me on the river and I was out short of the money. BP went on to a 4-way chop at 5:30! Congrats! Six hours. 19th of 84 entries. This was one of those up-and-down rides. I folded my first two hands from seat 10, then raised over a couple of limpers to 125 with a nice little J♦9♦, getting several calls. The flop was a perfect Tx8x7x and I bet 300. Seat 2 raised me to 600, the players between us folded, and I three-bet 2,300. He called and the turn put out Jx. I go all-in with the rest of my full stack, he calls with JxTx, and my straight holds through the river. I’ve got him covered by a quarter because he was SB in the first hand. I lost a little ground raising UTG1 with Q♣3♣ against UTG’s AxJx. and was down to T18,925 at fifteen minutes in. Missed an opportunity by folding Tx3x in SB when I didn’t call the 25 extra and the flop was Tx7x3x. Raised to 225 with KxQx in CO, go two calls, then got a flop of 2x3x4x. It was checked around. With a 5x on the turn, I folded to a bet. Half an hour in and my excursions had cut me down to T17750. Raised from UTG1 to 225 with 4♠6♠ and got one call. Bet 500 after the 8x7x4x flop and took it down. A couple hands later I called 350 in a 3-way hand with Q♦5♦ in BB but had to fold after whiffing the flop. SB on the next hand with K♣J♣ and three limpers. I raised to 55o and won. A couple hands later as CO I raised to 250 with Ax3x but folded to a bet of 800 on a king-high flop. In the twenty minutes leading into the end of the first hour, I went from T17,775 to 17,575. At the stroke of the hour, I played 8♠4♠, and made a straight to the eight by the river, but the guy I’d busted on my first hand had a straight to the 9 and knocked me almost back to the starting stack. T10,875. Not one to sit around dejected, I had a wheel draw with 2x3x, but missed on the river and had to fold to a bet, losing 800 chips in the encounter. Opened to 575 with 8♥9♥ and got two calls. The flop was T♦6♦3♦, which got checked around. Another Tx on the turn and I folded to a bet. Right color but too diamondy for me. Limped in with T♣6x on BTN and saw a Tx7x2x flop. SB opened with a 1,000 bet, mid-position called, and I re-raised to 3,000 to take the pot. Much speculation about my hand. I feel pretty proud of that play and a couple of others in this game. CO with A♥Q♦ and three-bet from 1,200 to 3,000. SB called and the flop hit as 8x7x8x. I folded to a bet of 4,000. That cut me down to T9,300 eighty minutes into the game. Raised UTG2 with JxTx to 750 and got 2 calls. A shove on the jack-high flop and I won my way back up to T10,950. On BTN with J♦9♦ again and I raised to 600 to see a flop heads-up: Kx4x5x. We checked to the turn, he bet 700, I folded, and he flipped KxTx. No need. In HJ, called an 800 raise in a three-way hand with 3♣4♣. Flop was Ax5xTx and I bet 1,200 with my gut-shot straight draw. I won. At the first break I had T12,550, the average was T15,833 before the T7,000 add-ons. At the end of the second hour of play, I called 400 UTG1 with K♠T♠. The blinds came along and the flop was ten-high. SB bet 500, I raised to 1,500 and took it. Called 1,100 from BB with K♠Q♠ (variations of that hand kept cropping up the night after it put me out of the Friday game), but had to fold after I didn’t connect. Next hand it was Q♣6♣ as SB and I bought the barest of fingernails on a Jx8x6x flop. I bet 800 and got two calls then folded to a turn bet. Jx5x made the best hand by catching the low end of a nine-high straight on the river. Raised with K♦9♦ and got a call. The flop was Ax9x6x and I bet 1,000. My opponent must not have had an ace! Called 1,200 with four others in the hand before me holding J♣T♣ to see a flop of A♠Q♠Jx. Everyone checked. 5♠ on the turn didn’t make my straight but I (and nobody else) could call the 3,000 to see the river so I don’t know if it or the flush would have come in. Still, I was up to T24,000. Raised to 1,300 with Kx6x and got called by a shorter stack. The flop was KxTx9x and we checked to the Kx turn. I raised to 7,000. He hemmed and hawed and dawdled then shoved for 1,800 more. I figured he had to have the better kicker and called for what was less than 10% of the pot. He turned over KxTx for the nuts. I felt kind of annoyed about the way he’d slow-rolled the nuts. Was it all about getting me to call the other 1,800? I was back down to T12,900 two and three-quarters of an hour in. Naturally, I got moved to a new table into the BB just a couple hands after paying the last time. Fortunately, in SB I picked up JxJx and shoved over three limpets to take a hand that put me up to T15,900. Had to fold a call of 2,700 with A♦8♦ when an all-in came after me. Pulled another fast one with A♦T♦ when I raised to 2,700, got two calls, and saw a flop of 7xJx7x. My shove won. Moved again after just twenty minutes. UTG with Q♥T♠ and I called a raise of 2,500 to of heads-up to a flop of A♠5♠J♠. My opponent bet 5,000 and I raised all-in. At least I had the ten of spades! He folded. Up to T28,000 but below the T35,836 average. 55 players left at three hours and twenty minutes. I went all-in over two limps with AxQx but got called by a smaller stack holding J♥9♥. He double-paired by the river and chopped me in almost in half. Down to T19225. When they chipped up the 25 pieces, the average stack with 45 players left was T43,800. I had just T16,625. Second hand after the break on BTN with JxTx my all-in was called by KxJx and I was out. Three hours and fifty minutes. 44th of 99 players. I keep going back to The Final Table despite the fact that the only time I’ve ever cashed there was in the Santa Bounty game last Christmas. My ITM there is truly horrible, unless you limit it to events with 50 or more players, and then my rate’s pretty much the same as it is anywhere else in town with 50 or more players. The only event I cashed in there, I made it to the final table of 131 players. These two games show a screw-up and just plain bad luck. Started off with the extra T1,000 because I signed up on-time. Picked up K♣T♣ UTG with a flush draw on the flop of A♣2♣A♦ and hit my flush with 5♣ on the turn but it made a full house for my opponent who called with Ax5x. Made a least flush on the flop with A♦3♦ and took down a T3,000 pot about twenty minutes into the game, then went up against KxQx with KxTx and top pair on the flop. We both drew down to four spades on the board, which kept the pot smaller since neither of us had one. I was holding T8,350 after that hand. 9♠T♠ and I made a jack-high straight on the turn. I bet 650 and shoved over a re-raise to felt a player half-an-hour in. T12,150 and I got moved to a newly-opened table. Forty minutes into the game, I called 1,600 early with JxTx. Two pair on the flop and a full house on the river and I tripled up against two all-ins. Then I lost T6,000 almost immediately as SB drawing for a flush with 3♦5♦. QxTx made a full house on the turn. Three-quarters of an hour into the game and I was still sitting on T28,125, with the chip average at just T7,655. Kicked myself a bit for folding Jx6x when I would have double-paired on the flop and hit a river boat in a hand with two players all-in. Played JxQx and raised to 600, calling a re-raise to 1,800 pre-flop, then folding to an all-in on the 3x3x[x] flop. Down to T24,800. Lost several thousand with Q♠7♦ against 8x9x on a flop of 6x7x8x. I had trips on the turn, but a Tx river card made his straight. Ten minutes later, I lost more than half my stack with KxKx again, calling an all-in against pocket sixes that made a set on the flop. I went into the break with just T7,825. The add-on more than doubled me up. I called with 7♣4♣ and hit the 9x7x6x flop lightly. I bet 1,100 and got a call then hit my 4x on the turn and managed to get an all-in called to take it down with two pair. That put me back up to T27,700, with the average at T17,733. Raised to 1,000 from UTG2 with A♥9♥. The flop was 7♣2♣7♠ and I folded to a 2,500 bet. Two hours in on BB with Q♦3♥ and the flop was all diamonds. I called the bets down to the river to see another diamond and bet 2,300 to win without a showdown. T33,525 at two hours and five minutes. Raised with A♥T♦ to 1,200 and got four calls. Everyone checked it to the river which turned up a king. The BB won. I raised to 1,500 from CO with Q♥T♥ and got an uncomfortable Ax9♦6♦ flop, then folded to a 2,500 bet. My next BB I had AxKx and re-raised to 3,800 from 800, getting an all-in from SB, which I called. He had 9x9x, the flop was AxJx and the rest of the cards didn’t matter. Two-and-a-half hours in and I was up to T34,450. Then I lost a chunk with J♣5♣ against KxQx. I was ahead on the JxAx8x flop but running tens gave him Broadway. Ten minutes later, my stack was at T28,800 (average T26,600), there were 20 players left, with 17 re-buys and 29 add-ons. With 4♥5♥ from BB, I saw a Kx2x2x flop then called a bet of 3,200 after the five on the turn. Another 1,200 went down the hole calling 1,200 on the river six. I was out soon after with Ax9x against KxKx. Three hours. 17th of 33 players. Among all the other anniversaries over the past couple of weeks was another, close to home. While the blog anniversary was January 1, yesterday marked one year since I won first place in my first large-ish tournament, a PPC promotional freeroll with about 80 players. Another good placement a couple days later–and Black Friday a few weeks earlier–gave me the impetus to play more live poker. Big tournaments in Portland poker over the next couple of weeks, with both Aces Players Club and The Final Table celebrating anniversaries, and a general gearing-up of the community for the upcoming summer series. I got off to a very hot start Friday night, sitting down a couple of hands in, picking up AxAx on my second hand, then going up against a player who sat at seat 2 a couple minutes after me. I’d picked up a premium QxQx and raised with nothing higher than a nine on the flop and we both put more money in. Another queen hit on the turn and he shoved, getting a call from me. A seven on the river made a set for his 7x7x but my set of queens held—with a river queen putting me on the high hand board—and he re-bought after his first hand. Funny story about that. Fifty minutes into the game, and I was up to 22,400, more than three times the starting stack. Then I lost 1,900 in a couple calls with 9♥T♥ and KxQx. I knocked out one of the PPC regulars with a 3x7x in SB when I caught a little of the 3x2x6x flop. G thought he was safe with his 4x4x, and he was through the 2x on the turn, but the river 7x sealed his fate and he re-bought. Ninety minutes in and I was at 25,750. I made it as high as 29,400 before the first break, but I called an all-in on a flop of A♦4♦ with 2♦5♦ against 4x4x and failed to catch another diamond, so I only had 21,900 before the T8,000 add-on. I kept up my occasional calls with low suited gaps but lost 1,500 calling pre-flop as BB with 3♠6♠ and another 600 as SB with 2♥6♥. About three hours in, I doubled up with a set of sixes against one of the larger stacks, putting me at 52,935, with the chip average at about 22,000. 8x8x held up against an all-in from a very short stack holding Ax9x, making up for losses to blinds and antes; I was at 52,000 even after the chip-up on the next break. There were 93 of 132 entries remaining after three-and-a-half hours, with 50 re-buys and 104 add-ons. 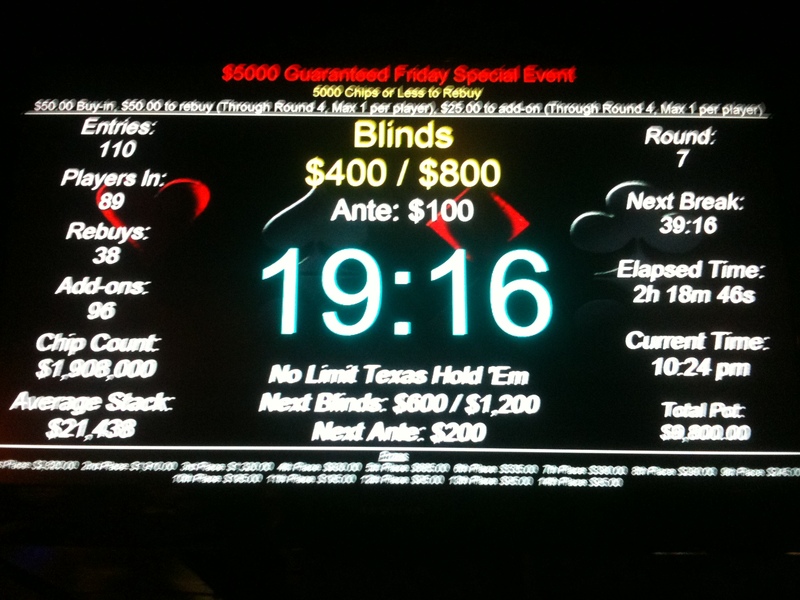 Half-an-hour later, with blinds up at 400/800/100, the number of players had dropped to 78. The average stack was 29,333: 36BB or (since we were 10-handed) an M-ratio of just 13, already in Dan Harrington’s “yellow zone” where small suited connectors and pairs lose value. I was sitting on 63,900 ten minutes after the top of the hour, when the average was 30,506. I raised with the heart version of the Mutant Jack and took down the blinds and antes without a fight, then finally knocked out G with QxJx when I made two pair. At the next break, four-and-a-half hours in, I had 86,600 (34,149 average) with 67 players left. Just 49 to go before the money. I lost a big chunk of ground calling an all-in with J♥Q♥ against KxJx. The board nearly gave me both a flush and a straight, but the better hand held out. Five-and-a-quarter hours in to the game, I was at 66,500, with the average creeping up under me to 40,140. Then I hit the high hand board again when KxKx made quads (with an ace kicker), knocking out another player and putting me up to 97,000. 7♦9♦ took in a lot of chips , hitting two pair on the flop and a full house on the turn. When the clock struck midnight after six hours of play, I had 142,300, not quite three times the 52,000 average, with 40 players left. The spade Mutant Jack (A♠J♠) failed me against 9x9x, and I lost 30,000 chips about twenty minutes later, then I shoved over two raises with TxTx to take the pot and managed to pull myself back up to 124,500 (average 65,700) just before the middle of the seventh hour. 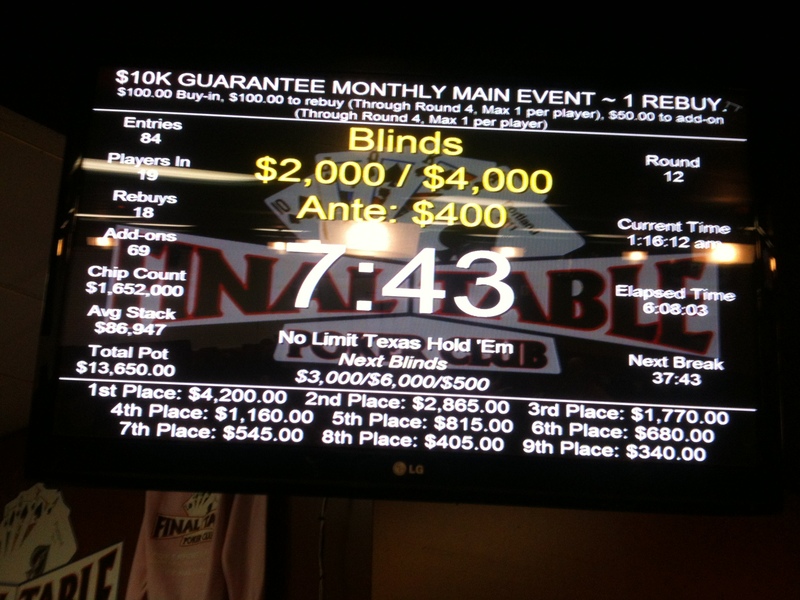 Blinds were 2,000/4,000/500; there were 35 players left. Just after the half-hour, I lost calling an all-in with QxQx against 9x9x when the nine showed on the flop, taking me down 26,600. Just ten minutes later, nines almost did me in again when I had AxQx. She made a set on the turn but a Tx on the river made me Broadway and I knocked out another player. Playing K♦T♦ from SB, I lost 8,500 to see the flop. Everyone checked the turn but I couldn’t pay the 8,000 to see if there was a jack on the river and the board was too clubby for me. The next break was at the end of seven hours of play, and I had 139,000. We were down to three tables (exactly 27 players), with the average stack at 84,740 and blinds going up to 3,000/6,000/500 (14BB, M-ratio of 6; mine was a paltry ten). With those kinds of numbers, the winnowing was taking place pretty fast. The money bubble was burst in just twenty minutes. The Poker Mutant deep in thought, wondering how he can get back on an even keel. I hadn’t found any opportunities to build up, however, and my stack had slipped to 110,500, with the chip average finally overtaking me to 127,111. 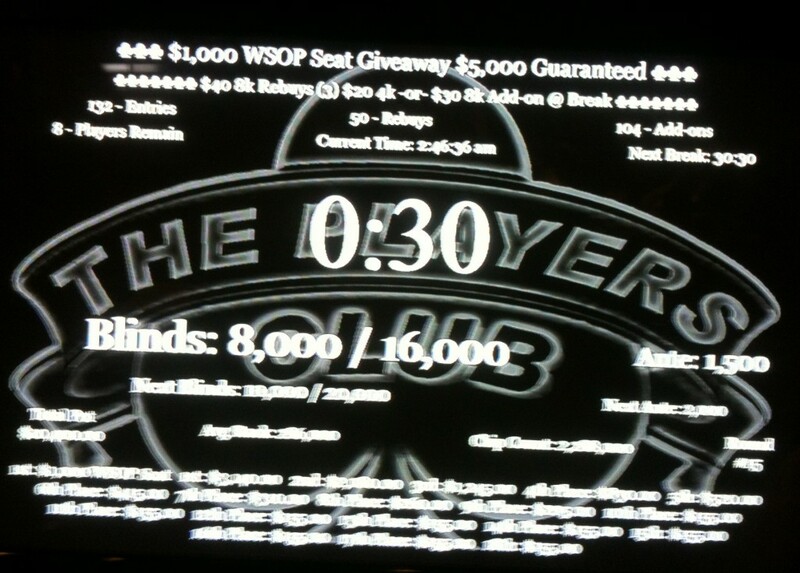 I blew 31,000 with Q♦8♦ going up against Ax8x and ten minutes after making the money I was down to just 75,500. I shoved with KxJx and won the blinds and a call, then went all-in again with K♠Q♠ half-an-hour later, just before the blinds went up to 8,000/16,000/2.000. There were 13 players left. My table had six players—so the blinds were coming around rather quickly—and there were a couple of very big stacks, including the guy I’d knocked out with quad queens back on his first hand. I had 87,500. Half-an hour later, I was still alive as the final table was made. Three of the players were original players at my starting table. I was the second-shortest stack at the table. I shoved with roughly a quarter of my stack in the pot as BB on the first hand—I didn’t record what with—and was beat. The first-place winner was the guy I took out with quad queens on his first hand. Eight hours and forty-five minutes. 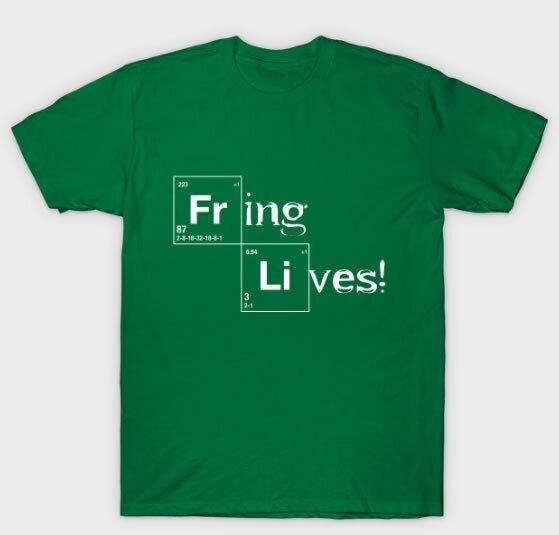 +193% ROI. 9th of 132 entries. This was the big-money game of the weekend. Running at full capacity and with people buying in after bustouts, there was no way the prize pool for this event wasn’t going to swell far beyond the guarantee (the PPC event prize pool was twice the guarantee itself). I bought the 8,000 chip preliminary add-on, so like most players, I was starting with 28,000 chips. I laid low for the first fifteen minutes, picking up 7x7x as UTG1. I lost about 1,000 when a player with an ace made a pair on the turn and I bowed out. 6♠T♠ gave me the inclination to raise, and I sort of liked the Qx9x8x flop, but Ax and 2x on the turn and river left me cold and QxTx won the hand. Lost some more with King Salmon (K♠7♠) when I paired my seven on the flop but the turn brought in a flush possibility for my opponent and I folded. Called 800 from SB with KxJx but folded to a raise to 5,000. Forty minutes in and I hadn’t won anything and was down to 23,475. On the last hand before the first break, I called a pre-flop raise to 1,200 with Q♥9♥ and caught an open-ended straight flush on the flop of T♥J♥5x. I brazenly shoved after a 5x on the turn and everyone folded. With the 8,000 extra add-on, I started the next session with 42,200, up a little over 6,000 from what I’d bought in for. With AxKx in the SB and a KxTxTx flop, I folded with 7,500 in the pot to a 40,000+ all-in bet. Another player called and the winner was AxTx over 7xTx. I stayed pretty quiet through the next half-hour; at the ninety minute mark I hadn’t won any more but I was still holding at 40,300. The final stats were in for the game: 153 entries, 148 players still in, 253 add-ons (both pre-game and at break), and a total pot of $43,250. I knocked out a player playing with 3♠6♠. I hit bottom pair and a flush draw on the flop and called his all-in of 9,000. He showed KxQx for a higher pair but my flush card came on the turn. Ten minutes later, I had 8x8x on BTN and raised, getting re-raised by BB. I called and we saw a flop of Qx7x2x. I put him on AxKx, which was a big mistake, and I shoved to give the impression I’d hit a set, but he had KxKx and I was out 41,200 chips, leaving me with just 13,500. This was the mistake that probably kept me out of the money in this tournament. Fifteen minutes later, that had dwindled to 6,900. I went into cornered wolverine mode (again), shoving with J♦T♦ from CO and winning the blinds. 8,100 chips. Payouts went up on the board. 22 places were getting money, with the top five prizes initially set at $12,555, $8,330, $4,995, $3,330, and $2,080. Things were getting serious. I was all-in on two consecutive hands. FIrst with K♠Q♠. I was called by QxJx and doubled up. Then I shoved AxJx over two calls and won with no showdown. People started complaining, but I’d managed to build back up to the starting stack, at least. Average stack was nearly 39,000 chips, though. On the first hand after the next break, I had KxKx in BB and shoved over several calls to take the pot. 21,300 chips with 130 players left. All-in again as UTG1 with AxQx. At least I was picking up some decent shoving hands. 28,400 chips after going through the blinds. Three hours into the game, the blinds jumped to 1,200/2,400/300. Another round of blinds and antes and I was down to 22,600 (M-ratio: 3.5). Just 101 players left. Shoved again with Ax9x and took the blinds. The next time they passed through I was down to 23,000. I finally picked up a significant number of chips in an all-in battle against a shorter stack with K♠J♠ against his QxJx. Three-and-a-half hours in, I had 46,500 (average stack: 60,523). 83 players left ten minutes later. 8x8x failed me again, this time from SB when I called a 15,000 chip all-in against Kx9x. The nine hit on the flop. I’d picked up some other chips along the way, though, so I was actually sitting on 26,500. Just short of four hours in, half the field was gone. 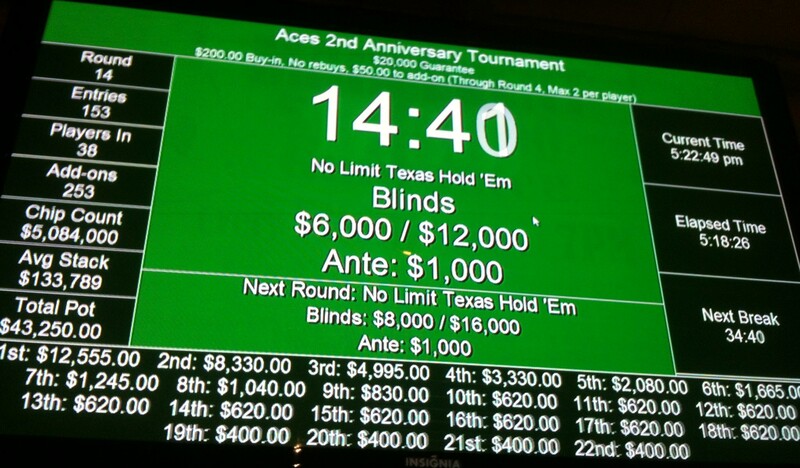 Only 72 players remained, with blinds going up to 2,000/4,000/500. I rode out the blinds again and was down to 36,500 (average 72,628), still securely in the red zone. At the four hour mark, I shoved over a call as UTG2 with JxTx and took the pot again. The pot was enough to put me up to 50,000 (65 left, average 78,215). I shoved as BB over the SB call as my last act at my starting table before I was moved. I got there with 57,500 chips, only 69% of the average stack, and with blinds at 3,000/6,000/500; an M-ratio of 4.2. My first act at my new seat was on BTN and I shoved with J♦9♦. The 13,500 chips in the pot from blinds and antes was substantial in comparison with my stack. Just a couple minutes later, I made an actual bet of 17,000 with AxQx and induced folds. I’d worked my way up to 65,500 (50 players left, average stack: 101,680). The next break began just after I’d gone through the blinds. I had 55,500—barely more than half the average stack—and blinds were going to be starting up at 4,000/8,000/1,000, leaving me with an M-ratio of just 2.6. Again. 49 players left. The big stack at our table was dominating from the other end. I went all-in over a raise from him with KxQx and I still had enough chips to get him to fold. That popped me up to 87,000 (average 105,916) briefly. I raised to 20K with A♠9♠ UTG. BB called. The flop was king-high, there were no spades, and I folded to an all-in. Another round of blinds took me down to 51,000. The big stack wasn’t liking my shoves any more than the other table had. I was all-in again against his raise and he folded, saying he had KxQx. I (probably mistakenly) flipped over my KxQx. 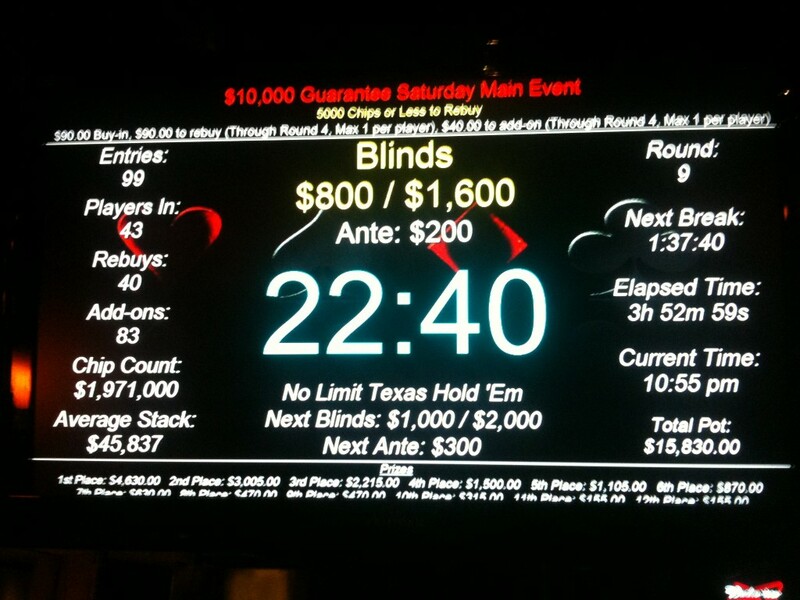 43 players left as we approached the five-hour mark. I had 68,000 chips left and needed a double-up badly. I was playing so tight I folded Q♠T♠ UTG. My final hand was against the big stack. He finally called my all-in (this time with KxJx) and he had 6x6x, which held up. I think he probably would have called even if I hadn’t showed on the previous hand. The call with the eights against the kings was significant. I never made it back up to the chip average after that point, although I managed to stay in play for another three hours plus. Five hours and fifteen minutes. 38th of 153 players.